The United Nations has called violence against women "the most pervasive, yet least recognized human rights abuse in the world" and there is a long-established history of the systematic victimization of women by the state during times of peace and conflict. 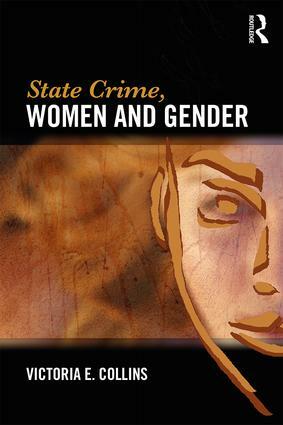 This book contributes to the established literature on women, gender and crime and the growing research on state crime and extends the discussion of violence against women to include the role and extent of crime and violence perpetrated by the state. State Crime, Women and Gender examines state-perpetrated violence against women in all its various forms. Drawing on case studies from around the world, patterns of state-perpetrated violence are examined as it relates to women’s victimization, their role as perpetrators, resistors of state violence, as well as their engagement as professionals in the international criminal justice system. From the direct involvement of Condaleeza Rice in the United States-led war on terror, to the women of Egypt’s Arab Spring Uprising, to Afghani poetry as a means to resist state-sanctioned patriarchal control, case examples are used to highlight the pervasive and enduring problem of state-perpetrated violence against women. Selected for the Outstanding Academic Title (OAT) Award 2017 by CHOICE magazine. Victoria Ellen Collins is an Assistant Professor in the School of Justice Studies at Eastern Kentucky University. Victoria’s research and teaching interests include state perpetrated violence, victimology, white-collar crime, transnational crime, and violence against women. Some of Victoria’s recent publications have appeared in journals such as International Criminal Law Review, Critical Criminology, Contemporary Justice Review, and The Australian and New Zealand Journal of Criminology, and Social Justice.